Ashampoo Uninstaller 8 is a powerful software uninstaller that will remove every trace of unwanted programs, and now features a clearer, more streamlined interface. Installation tracking is excellent as ever, and the bonus PC maintenance tools are a welcome touch. Uninstalling software can be a nuisance – if you rely on programs’ own uninstallers, or Windows’ add/remove programs dialog, you can only select one program at a time to remove and you're often left with temporary files, empty directories and old entries in the Windows Registry. These might not take up much space by themselves, but over time that clutter accumulates and it can cause errors if you later want to install a new version of the same software. 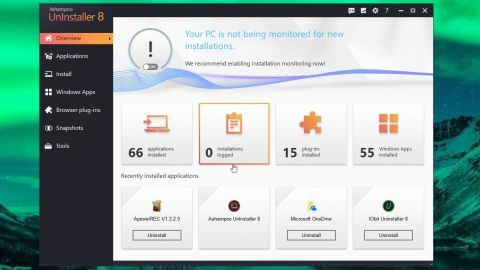 That's why a good software uninstaller is such a worthwhile investment, and Ashampoo has updated its premium offering, Ashampoo Uninstaller 8, with several new features and enhancements for the year ahead. The software is usually priced at $39.99/£29.99/AU$49.99, but is currently discounted to $20/15/AU$25. Despite performance improvements under the hood, Ashampoo Uninstaller's interface has mostly remained the same since version 7, with simple menus and clear icons (plus a choice of dark and light themes), but there are some differences. The most noticeable of these is the simplified overview screen, which now contains fewer statistics, letting you focus on the numbers that matter (such as the number of applications and plugins installed). One of Ashampoo Uninstaller's key features – the ability to automatically track changes to your PC so they can be easily reversed at a later date – is now given extra prominence, but you can also choose to leave it deactivated and log installations manually using the ‘Install’ option in Ashampoo Uninstaller’s sidebar menu. Select this button, then locate the installation file on your PC and run it like normal. Once you’ve finished, click ‘Installation completed’ to capture a new image of your PC. When this is complete, you’ll see how many new files have been added to your system, how much space the new program occupies, and how long it took to install. When installations are logged, Ashampoo Uninstaller takes a ‘snapshot’ of your PC before the software is installed and another one after, so the changes can be easily reversed. You can also take 'snapshots' yourself at any time - not just when a program is installed - and compare them to see how your system has changed over time. When you uninstall an application, the option to automatically perform a deep scan for residual files is selected automatically. After the software has been uninstalled, Ashampoo Uninstaller will tell you how many (if any) files and registry entries are left over, and offer to delete them for you. If you like, you can also have the files 'wiped' (overwritten with random data so they're impossible to recover), though this takes a little longer. Ashampoo Uninstaller 8 doesn't just remove software that's been logged (although this is quicker) - it can clean up any unwanted software. This includes Windows apps – either ones pre-installed with the operating system or downloaded from the Microsoft Store – and there's even an option to uninstall them for all users in the Settings menu. This is very handy, but bear in mind that any of Microsoft’s own apps might be reinstalled next time you download a Windows update. If your hard drive is getting full, a quick dip into Ashampoo Uninstaller 8 can help you see if there are any applications you could remove. Installed programs are split into helpful categories, including ones that have been recently installed, ones that have been logged, ones that are particularly big, and any that have been negatively rated by other users. Ratings are a particularly helpful tool, enabling you to see at a glance if there’s any potentially malicious software on your PC that should be removed as soon as possible. You can add your own ratings to help fellow users by clicking the stars beside a program’s name. Your rating will be factored in the next time Ashampoo updates the software. That's not the only way to Ashampoo Uninstaller 8 can help keep your PC free from clutter; as a bonus, Ashampoo has thrown in a bundle of extra optimization features. Some of these (such as the registry optimizer and startup manager) are pretty standard tools you'll find in almost any PC maintenance software, but the file associator isn't something you see very often, and is a very handy way to solve the problem of files opening with a program other than your preferred option. Ashampoo Uninstaller 8 is a superb software uninstaller, and will be a real boon for anyone who enjoys trying new programs and is tired of spending hours cleaning up afterwards.